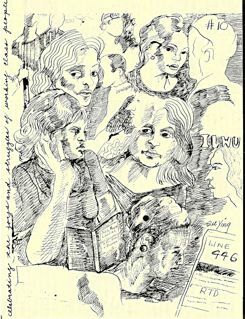 The mission of the festival is to showcase art that celebrates the joys and struggles of working-class people; to continue the process of developing the annual festival; and to stimulate artists to respond, either individually or collectively, to the social challenges of the changing work and community environment. 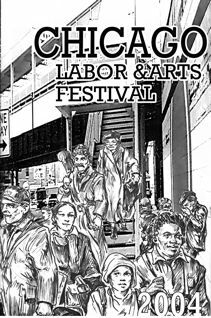 The first Chicago Labor & Arts Festival was held in September, 1997. 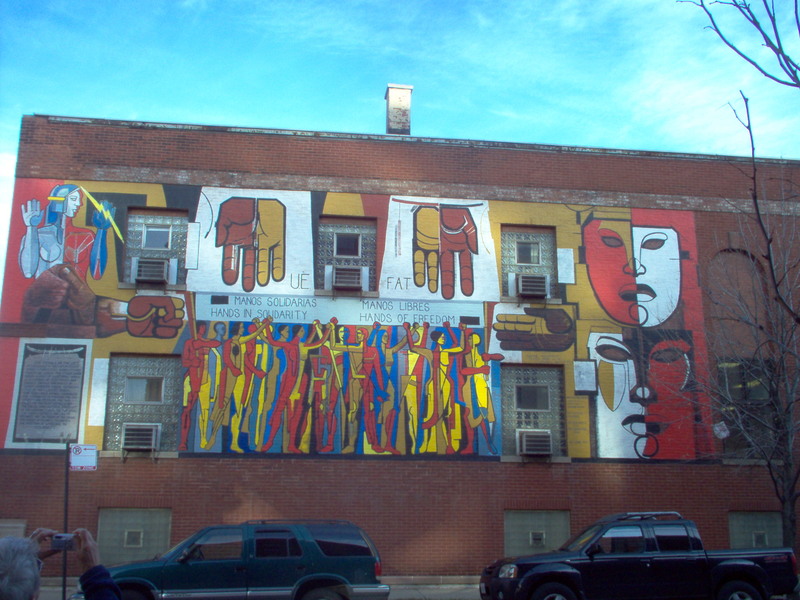 It was held in conjunction with the completion and dedication of a mural produced on the Chicago UE building by lead artist Daniel Manrique from Mexico. This followed the earlier mural completed by Mike Alewitz, from New Jersey, in the building of the Mexican union, FAT. The cross border project had been a process several years in the making. The connection between art and labor has been a matter of artistic concern for many years. Evidence of this is seen in the inspiration that labor themes have given to writers and visual artists for centuries, though we remember it mostly from our own immediate history in the depression. 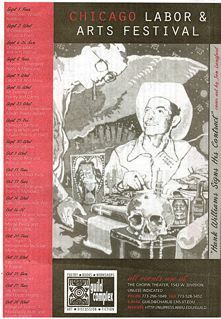 More recently, in the 1980’s, activists in Chicago connected with Guild Books and in Los Angeles with Midnight Special began activities which were called “Art Meets Labor” and “Art Works”, respectively. 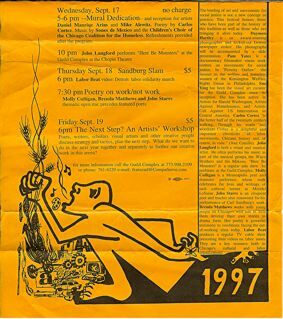 When we began the festival in 1997, we were partly conscious of some of these connections. The time seemed right to initiate a program that celebrated the connection between arts and labor. Discussion of what is working class? certainly more than trade union, more than those now working (full or part time). What is working class in the global economy? What is working class in the age of electronics? Importance of both aspects of joys and struggles. This is not solely about bleakness and horror, but also about life and vision. 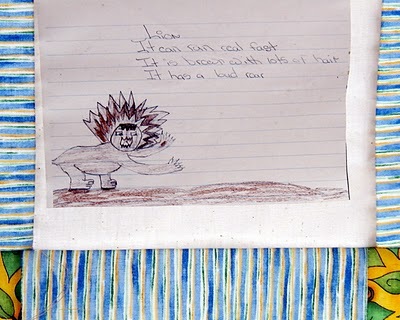 Work and art were at one time intimately related, not separate categories. How do we engage the artists in the festival in terms of their own art? How do we stimulate the art/creativity in those who do not consider themselves artists? We’ve held 10 festivals so far; the first seven were in September, coinciding with American “Labor Day.” We did this consciously to connect with the trade union movement and what we perceived most Americans saw as labor’s holiday. However, in the back of our minds all along, was the history of international labor day, May Day, which originated in our own home town in 1886. By 2002 a number of the unions we had been working with suggested that the time was right to switch to a May celebration. We’ve made the festival a May celebration ever since. 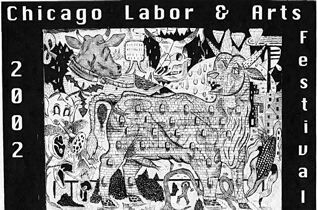 Why the Chicago Labor & Arts Festival? Why Now? How can we answer this without asking: What is Labor? What is Art? Our answers to these questions reflect a four year process of discussion and planning the festivals. First of all, labor is broadly the group or class of people who work and do not own the means of making what they produce; who have worked but who have been “downsized” out of a job; who have no hope of ever holding a job that will provide their means of material and cultural sustenance. This group of people works full time, part time and no time; it has permanent jobs, temporary jobs, pieces of jobs. It gets paid good wages, bad wages, welfare or no fare. It belongs to the AFL-CIO, the AARP, the Welfare Rights Union, and mostly to no union at all. By this definition, labor means better than 90% of the people in the U.S.A. It certainly means better than 90% of all artists. The advent of art as a saleable item has meant at least these two things. First, the artist has become a special group of labor that earns its living by selling its ability to make art (e.g., commercial visual art, advertising, music, writing). Second, those who cannot make a living at art become branded as non-artists, not creative. The defining factor is the marketplace of commodities. For us, however, art is not the special province of immensely talented individuals. Art emanates from the experience and action of each individual, taking different and surprising turns and forms, within a social and collective context. Turning art into a thing whose sole object is the procurement of the means of subsistence is part of a process which began with the introduction of commodities in general. The consequence of this development is the wide disparity in wealth and poverty , a disparity that we still see growing. This festival seeks to celebrate the joys and struggles of working-class people and to celebrate the creative human spirit. We seek through art to popularize what our history books erase. We want to stimulate each other to think of ways that we, as creative people, can use our imaginative powers. My epic award winning play, LUCY PARSONS: ANARCHIST was directed by me at Labor Fest 2012 in San Francisco on July 18th to an overflow crowd at the 518 Valencia performance space. Steve Zeltzer asked for a reprise reading of the play which was first presented with a Puffin Foundation grant in 1999. 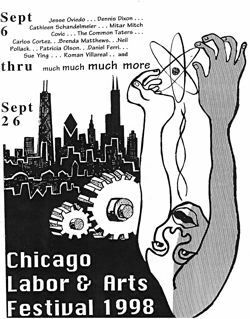 Since Lucy Parsons was an activist in Chicago all her life I think the Chicago Labor and Arts Festival would be a great venue for the presentation of this play as a production or a reading in a future festival. Please let me know if you are interested in looking at the play. I look forward to hearing from you.